Why dont you make a thread about learning, cheating on tests and other things somwhere else? Here you can only talk about RIP and how great RIP members are. Cheating on exams is not something you should be bragging about. lol k i c. bai bai. Isn't the [RIP] clan great? Bring it on ingame or else. I agree on the second part as well. If you want to reply here, you must take the test. Only participants with score higher than 100 will be allowed to post here. When you reply, you have to post a certificate you get in the end of the test. You can retake the test as many times as you want (questions are same all the time and you get the sheet with correct answers in the end). You have the unusual talent of being equally good at both mathematical and verbal skills. That, paired with your thirst to learn through experience, makes you an Inventive Inquisitor. Your strength lies in the methodology you have naturally adopted to understand the world. Basically, you have perfected "learning through living." You have a unique ability to teach others by taking them through actual experiences. Your talents come in handy especially when confronted with unfamiliar or unproven situations. Most people search their brains for previously stored information that might help in a given situation. You, however, take things as they come and see things as they are. You are a great improviser and are probably open to an unusual amount of change. How about you take the test? That's nothing, judging based on your overall linguistic skills and ability to comprehend what others say to you, there are special needs people smarter than you. 135! YEAAAAA YES! I CAN POST HERE! YEAAAAA. They should have time restraints. since they dont, this test is total bullcrap. btw, not studying is for noobs. any decent minded person can not study and pull off 85%. it takes heart and determination to study and work hard. for those noobies that think it's cool to "seem" smart and not study...shame on u! i of course, am the biggest hypocrite ever. Well, I didnt want to surpass Kray's achievement, though it would look weird if I just gave a number slightly above his score without backing it up. 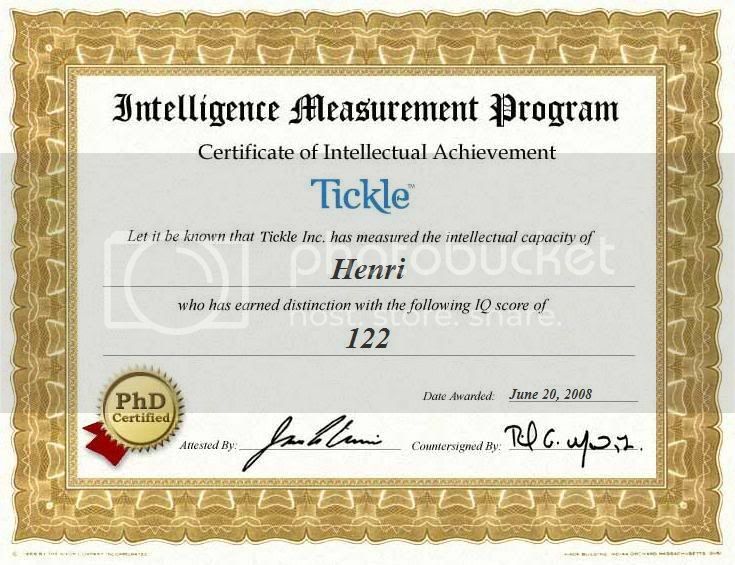 Took me less than 10 mins - by reading the thread I knew there was no time measurement, and an IQ test is nothing without it in my opinion. 131. This is like the 3rd time I get that score on this test, and the 3rd time I take this test. I'm unsure if this is my actual IQ, since I never bother to take any real tests though. lol des, u dont count, ur special. and adam, FCK YOU FOR BEING SO SMART!